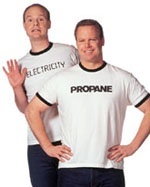 Many roofers use propane for their kettles and hand torches. We can supply you with 20# cylinders to 1000 gallon tanks for vapor or liquid draw to be delivered to your jobsite. Call us for a quote for all of your temporary heating needs, we stock all types of Heaters from simple convection type that do not need electric to 400.000 btu theromostat controled blower heaters to meet your every need. The Gas House supplies extension hoses and 100# portable cylinders or up 1000 gallon tanks. Construction Heat - We offer temporary tank sets of any size to help contractors facilitate quicker dry times of paint and drywall. In many cases the temporary tank becomes the permanent tank at the construction site. Temp. heat is often the only option available prior to the installation of the furnace or other heating source.